There is no basis to accept Breivik’s initial claim that he acted alone for several outstanding reasons: First, the car bomb, which devastated downtown Oslo, was a highly complex weapon requiring expertise and coordination – the kind available to state or intelligence services, like the Mossad, which specialize in devastating car bombs. 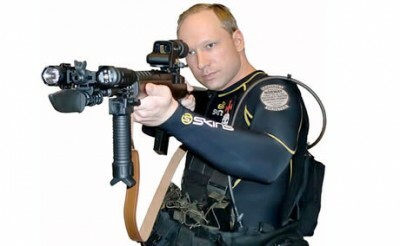 Amateurs, like Breivik, with no training in explosives, usually blow themselves up or lack the skill required to connect the electronic timing devices or remote detonators (like the unsuccessful ‘shoe’, ‘underpants’ and ‘Times Square’ bombers have proved) . Secondly, the details of (a) moving the bomb, (b) obtaining (stealing) a vehicle, (c) placing the device at the strategic site, (d) successfully detonating it and (e) then gowning up in an elaborate special police uniform with an arsenal of hundreds of rounds of ammunition and driving off in another vehicle to Utoeya Island, (f) waiting patiently while armed to the teeth for a ferry boat, g) crossing with other passengers in his police uniform, (h) rounding up the Labor youth activists and commencing the massacre of scores of unarmed youth and finally (i) finishing off the wounded and hunting for those trying to hide or swim away – is not the activity of a lone zealot. Even the combination of Superman, Einstein and a world class marksman could not perform those tasks. The media and NATO leaders must view the public as passive morons to expect them to believe that Anders Behring Breivik “acted alone”. He is willing to take a 20 year prison sentence if it means, as he maintains, that their collective action is the spark that ignites his comrades and advances the agenda of the violent and legal far rightwing parties. Facing a Norwegian judge on July 25, he publicly declared the existence of “two more cells in my organization”. According to witness testimony on Utoeya Island shots from two distinct weapons were heard from different directions during the massacre. The police say they are… “investigating”. Needless to say the police have found nothing; instead they put on a “show” to cover their inaction by raiding two houses far from the massacre and quickly released the suspects. The most serious political implication of the terrorist action, however, is the conspicuous complicity of top police officials. The police took 90 minutes to arrive at Utoeya Island , located less than 20 miles from Oslo , 12 minutes by helicopter and 25 to 30 minutes by car and boat. The delay allowed the right wing assassins to use up the ammunition, maximizing the death toll of young, anti-fascist activists and devastating the Labor youth movement. The police chief, Sveinung Sponheim, made the feeblest excuse and cover-up, claiming “problems with transport”. Sponheim argued that a helicopter “wasn’t on standby” and they “could not find a boat” (Associated Press, July 24, 2011). Yet a helicopter was available; it managed to fly to Utoeya and film the ongoing slaughter, and over half of Norwegians, a seafaring people for millennia, own or have access to a boat. A police force, faced with what the Prime Minister calls the ‘worst atrocity since the Nazi occupation’, moving at the pace of an arthritic turtle to rescue youth activists, raises the suspicion of some level of complicity. The obvious question arises as to the degree to which the ideology of right wing extremism – neo-fascism – has penetrated the police and security forces, especially the upper echelons? This level of “inactivity” raises more questions than it answers. What it suggests is that the Social Democrats only control part of the Government – the legislative, while the neo-fascists influence the state apparatus. The fact of the matter is that the Norwegian military has no problem promptly dispatching 500 troops to Afghanistan, half way around the world and providing six Norwegian Air Force jets and pilots to bomb and terrorize Libya . And yet they can’t find a helicopter or a row boat to transport their police a couple hundred yards to stop a domestic right wing terrorist – whose murderous rampage was being described second by second by the terrorized young victims on their cell phones to their frantic parents? The “Progress Party” is now the second largest political party in Norway . If a “conservative” coalition defeats Labor, neo-fascists will probably sit in the Government. Who knows, after a few years of good behavior, they might find an excuse to commute their ex-comrade’s sentence . . . or proclaim him mentally rehabilitated and freed. Clearly what is needed is the immediate withdrawal of all troops from imperial wars and a systematic, coherent and organized fight against domestic right-wing terrorists and their intellectual godparents, in America , Israel and Europe . Labor youth must go press on with their demand that the Labor Government, under Prime Minister Jen Stoltenberg, recognize the nation of Palestine and implement a total boycott of Israeli goods and services. A national and international political-educational campaign must be organized to expose the links between respectable electoral fascists and violent terrorists. The Labor Youth martyrs of Utoeya Island should be cherished and their ideals taught in all the schools. Their far-right enemies and supporters whether overt, covert or directly complicit, should be exposed and condemned. The best weapon against the renewed neo-fascist onslaught is a political and educational offensive, taking up the anti-fascist, anti-Quisling (Norway ’s notorious Nazi collaborator) fighting traditions of their grandparents’ era. It’s not too late – if the Labor Party, the Norwegian trade unions and the anti-fascist youth act now before the flood of resurgent fascism.